I love to do work in and around the home. Making little changes and additions to the property helps me to improve it gradually. But, there are certain projects, like improving the kitchen, which I feel are sometimes beyond me. And it’s in these situations that I like to get a handyman involved. It’s important to make sure these projects are done right, as they could increase the sale prospects of your home. These are some of the key reasons why I would recommend this approach so highly. I don’t think there’s any substitute for experience, and there’s no doubt a handyman will have experience. Whatever the project is they’re going to know the ins and outs. So they’ll know exactly how to approach the work, and how to tackle any problems that arise. Experience is also vital in getting work done fast and to the required standard. That’s why it’s so important to bring in a handyman for certain tasks. You’re also going to find that it’s a more efficient way of approaching home renovations. With a handyman focusing on the complex tasks, it frees you up to do other bits and pieces. I love this because it means I can get much more done around the home in a shorter space of time. Another thing you need to remember is that a handyman is already going to be equipped. 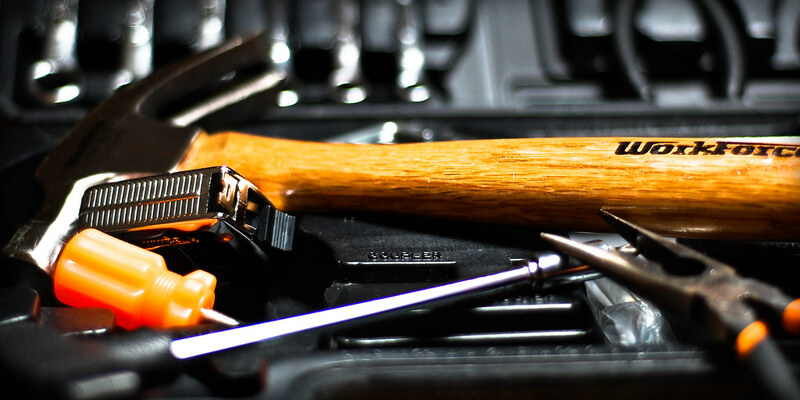 When you undertake any work or projects, you’re going to need specific tools and equipment. Now, you might not be aware of exactly what you need. But the handyman will be, and he will already have the necessary tools to complete the tasks at hand. I found this to be a great way of getting tasks done, and not having to shell out on tools. Let’s be honest, there’s nothing worse than messing up a project and having to pay to fix it. Trust me, it’s infuriating. That’s why my suggestion of a handyman is such a cost effective one. It means you’re only shelling out for manpower. You don’t have to spend money on tools, equipment, and materials. It also means that the job is done at the first time of asking. You won’t need to pay to fix any mistakes you might make. As with anything creative, it’s always good to have a fresh approach. I like to attempt things myself, but it’s not always the best way of doing something. A handyman has experience and versatility. They have done their job for many years, and will have different ways of doing things. Some of these may be things you’ve never considered that will make the project much better. So this is one of the great advantages of having someone experienced on board. I know that a lot of people like to try to do things themselves at home, and you might be one of them. But, as you can see from my post, I would strongly recommend you hire a handyman. When it comes to this kind of thing, there’s no substitute for professionals. Get on the phone and hire someone today, you won’t regret it! Add Value, Improve Your Kitchen! One of the most straightforward ways of modernizing your house is to update your key rooms. Redecorating doesn’t take all the hassle of extensions and other larger scale projects, so it’s a great place to start! The kitchen is the heart of any home and therefore is one of the rooms that new buyers will take the most interest in. Along with the bathroom, it is the room that would take the most money to modify. Because of this, you’ll find that buyers will tend to pay more for a house that has higher specs in these areas. Here is how you can improve your kitchen, and consequently add value to your home. The first thing you need to consider is what color scheme to go for. It’s important to choose this first because it will affect your choice of units and worktops. To get more value, it is best to choose neutral colors. Don't pick something too striking like white and red. There are going to be less potential buyers that these color will appeal to, than if you picked creams. Light gray is also a great color to go for as it is more modern than the typical beiges. Next you may want to pick your units, worktops, knobs, and anything else that needs installing. Here you could really pick anything you fancy yourself, and it won’t necessarily affect your profits. However, if you want to make some money, you may want to consider only upgrading a few of these elements, and upcycling those that can still be used. Dream Doors Kitchens can do this for you. They can give your kitchen a facelift without you having to spend so much. Whichever option you choose, you should definitely have an installer do the work for you. Shabby workmanship will really decrease the quality of your new kitchen, which isn’t worth it in the long run. Once you have everything fitted, you should consider replacing the floor if you have a material down of lesser quality like linoleum. Replace it with a wooden floor, or for an even smarter finish you could look at marble. This will further improve the standard of your kitchen, though it’s only the floor, future buyers will still notice it! Look at improving the lighting in your kitchen. Choose a more modern fitting for the ceiling, or replace it with stylish spotlights. You could also add some lighting strips underneath your higher cupboards to make the room look even more contemporary. Finally, finishing touches are really important. Invest in a fancy hose tap for instance! If your kitchen is big enough, you can also now buy an island on wheels. Islands always look impressive in a kitchen, but can be pretty expensive to install. These are great because you can move them about, and take it out again without any hassle if it feels too much. These are great for practicality as you’ll have more cupboard and workspace. Though improving your home is great for everyone currently living in it. However, it’s also nice to know that you might get a little bit of the money your are putting into it back later down the line. Got any more ways you can add value to your property through your kitchen? I would love you to leave a comment and share it with the rest of my readers.. Here's what has been happening for me recently.... My daughter turned 2, yay for another party and more toys that we have no room for! My husband went away for work for a few weeks, we start building a house very soon (I hope), we have a baby and then we move house. You know.....nothing special......OMG MY MIND IS IN OVERDRIVE!! Not only am I constantly thinking, planning, thinking, writing lists, thinking, organising and thinking but I'm 36 weeks pregnant and can't sleep anyway! I'm finding it so hard to switch my mind off and sleep, and the few times that I can the basketball under my pajama top makes me uncomfortable and suddenly decides that it's sleep time for mum so it must be play time for me! Why not right??? I already love the little bean so much it hurts but sometimes mummy needs a break ok.
My trips to the shops at the moment are often happening everyday as I think of new things to do and add to my list. But, on a recent trip to my local Kmart I stumbled upon an absolute gem. 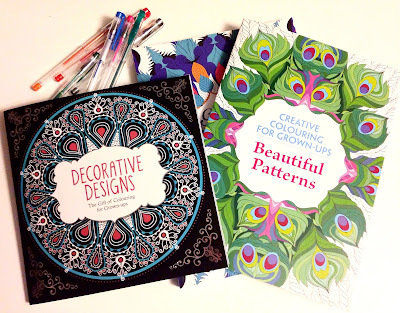 They're coloring books for grown ups!! 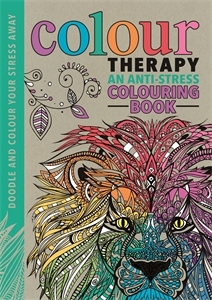 Now I love colouring just as much as my daughter so this was right up my alley! It's obviously a lot more complicated than colouring in animals and Elsa from Frozen. You really need to concentrate to stay inside the tiny lines. As much as shading and colouring with pencils is great, I have actually found that gel pens actually work the best. 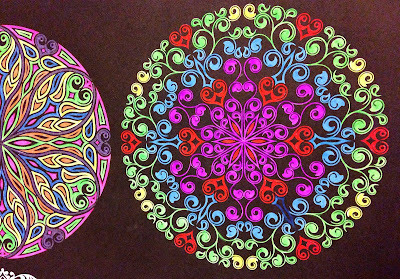 The fine point makes staying in the lines easier and the colours you can get are amazing and bright. You can even add a touch of metallic or glitter to your drawings if you want. 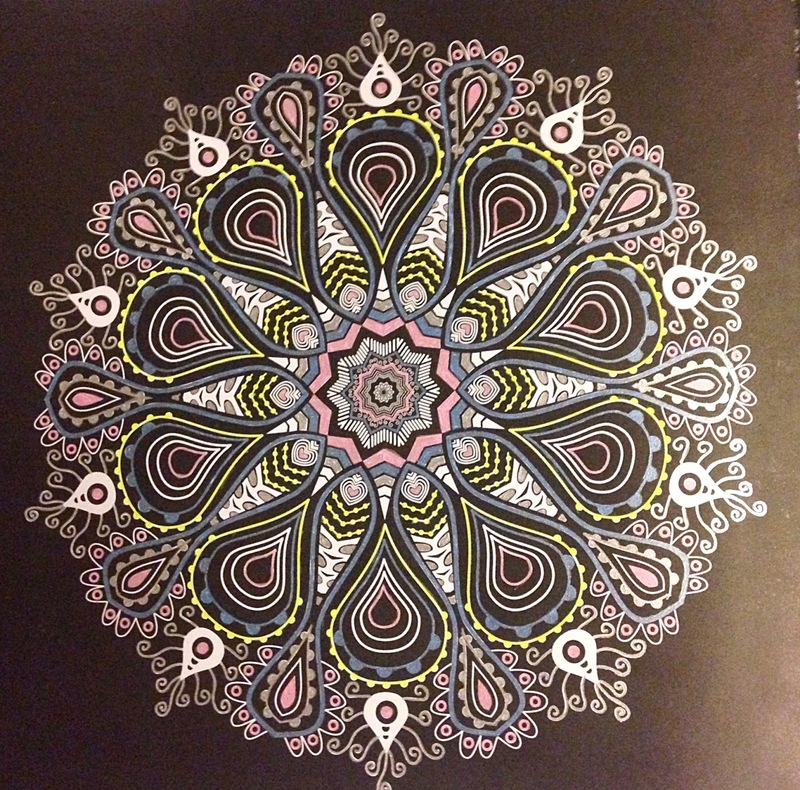 I have only just started on my adult colouring journey but I'm loving it so much. After doing a bit more research on the topic I found the website that sells the books, Michael O'Mara Books, or if you, like me, are based in Australia there is an Australian publishing site that you can go directly through, Hardie Grant Publishing. So many books to choose from. If you prefer to have a scroll through before you purchase I have found them at Target for only $13 and at Kmart for $10-$12. You can pick up a pack of 30 gel pens for only $5.....one of the cheapest hobbies I've stumbled upon so far! My husband is very happy!! I have already found the book I want to grab next, I haven't seen this one at the shops yet but will definitely grab it online as soon as I have tackled a few more pages in the books I have. 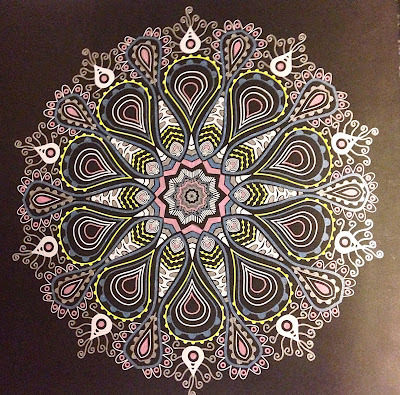 I have been having fun colouring the last few nights before I've hopped into bed and it really helps to switch off all that thinking. I can concentrate on the one thing, relax and have fun while I'm doing it. 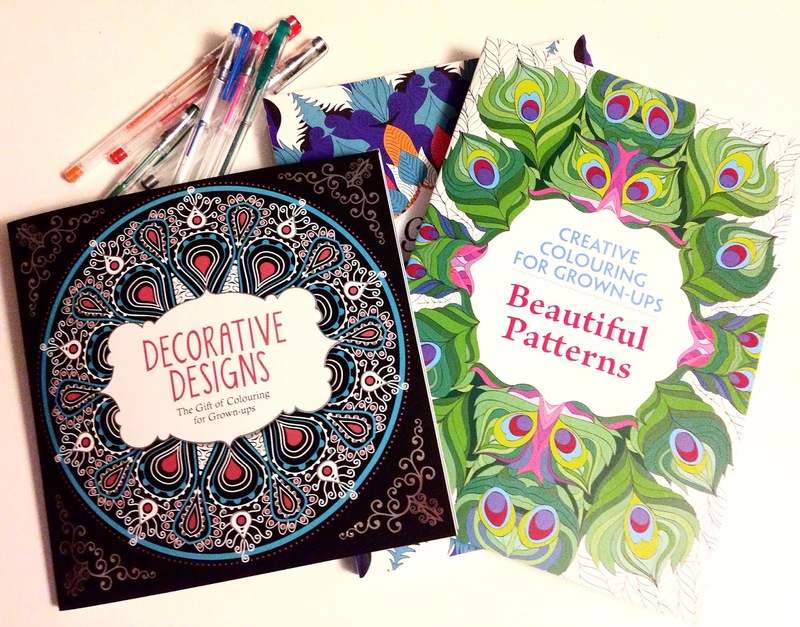 I may or may not have bought 3 colouring books already, I know I'll go through them pretty quickly with all the sleepless nights ahead of me. So switching off the brain is sorted, now to work on the basketball player shooting hoops at all hours of the night.